We got back last night from a marathon Midwest tour of prospective colleges for Josie (plus a visit to my inlaws in MKE and plenty of Kopp’s frozen custard, which is so much better than Shake Shack it is LAUGHABLE) and came up with this in the car on the way home. At one art school tour, a mom asked so many questions about the animation equipment & software–and was so critical of the same–that I thought the friendly student tour guide might cry. Terrible. First, let me take a moment to hyperventilate HYSTERICALLY that you have a child who is even in the ballpark of thinking of the college-word just now. WASN’T SHE JUST THIRTEEN?????? Secondly, let me wheeze hysterically at the memory of being the reluctant boater-hatted tour guide. GOOD GRIEF that was THE WORST. I would have paid someone to do dental extractions on me in lieu of having to do it again. I’m pretty sure I hid my first year, and ditched my people in a building somewhere. We got T-shirts, though, so obviously we all did it again. And again. And again. YES to each and every one of these things. We’ve done 4 tours (so far) and easily checked each of these off on every tour. Crazy. And exciting. And hyperventilation-inducing. 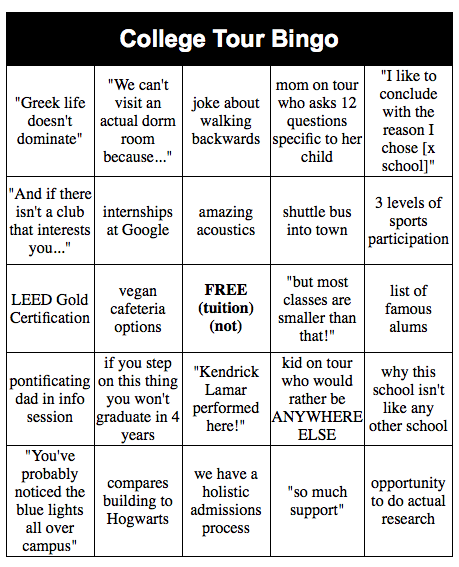 I mostly skipped the tours because I found them boring but I’m pretty sure I got all the squares ANYWAY.